Though few in number (approximately two million people at the height of their empire), Mongols were important in Eurasian history. Under the leadership of Genghis Khan, the Mongols created the second largest empire in world history, ruling thirty-five million square kilometres (13.8 million square miles) and more than 100 million people, nearly equal to the British Empire in land area. 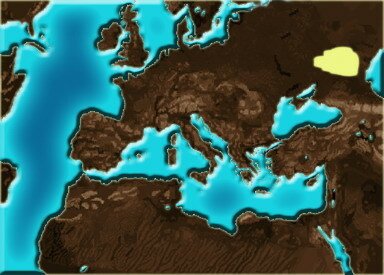 At its height, the Mongol Empire extended from Manchuria in the east to Hungary in the west, and from Russia in the north to Java island in Indonesia in the south, and it included most of the lands in between, such as Afghanistan, Turkey, Uzbekistan, Georgia, Armenia, Russia, Persia, Pakistan, China, and much of the Middle East. The Mongol invasions of the thirteenth century, culminating in the subjugation of Baghdad in 1258 and the demise of the Abbasid caliphate, had an enormous impact on large areas of the Islamic world, which now experienced its greatest threat. These conquests were carried out under the command of Hülagü, a grandson of Genghis Khan, who assumed the title Il-Khan, meaning "lesser Khan," a subordinate of the Great (Mongol) Khan in China. The name Il-Khan (or Ilkhanid) is also used to describe the branch of the Mongol dynasty that ruled over Iraq, the Caucasus, parts of Asia Minor, and all of Iran, as far east as Central Asia.